Long ago dental work could be painful and stressful—often for both patient and practitioner. Thankfully, that time is long past: today, most procedures are painless in large part due to local anesthesia. Local anesthetics are numbing substances applied to specific areas of the body like the teeth and gums to temporarily block pain during a procedure. And because they only affect a localized area of the body, you remain conscious and alert throughout the procedure. To achieve the level of numbing necessary for dental work, we often need to deaden the gums using a needle to deliver the anesthetic. But then this poses a secondary pain concern—the needle stick itself. Again, topical anesthesia comes to the rescue in the form of a swab, patch or spray applying an anesthetic directly to the top layer of the gums at the injection site. This numbs the area and prevents you from feeling the needle stick. It's highly probable, therefore, that from start to finish you won't feel any discomfort during your dental work except perhaps for a little pressure. Local anesthesia truly is a game changer for dental care—and not just for the patient. 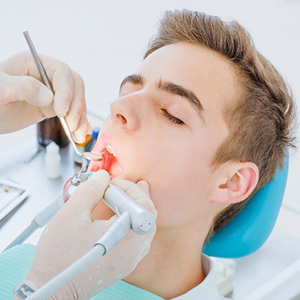 A dentist who's concerned about their patient's comfort level may work hurriedly to complete a procedure. But if their patient is relaxed, the dentist can work calmly and methodically. The result is better, more focused care. For all its improvements in the patient experience, though, there has been one consistent complaint—the numbness that often lingers for a while after the procedure is over. But there have been advances in recent years that have helped reduce this irritation: new anesthetic agents (even some that can reverse the anesthetic effect) and fine-tuned dosages can help keep residual numbing to a minimum. Not all procedures like routine teeth cleanings or enamel shaping require anesthesia. But when it's appropriate, local anesthesia can make your next dental visit much more pleasant.